Ursula Ströbele and Andreas Greiner were still ecstatic from their success the night before. Their installation, ‘Evolutionary Urge: 24h Sculpture (Digital/Virtual)’, opened at 7pm on Friday, and was still open for a few more hours, when we met, until 7pm on Saturday. 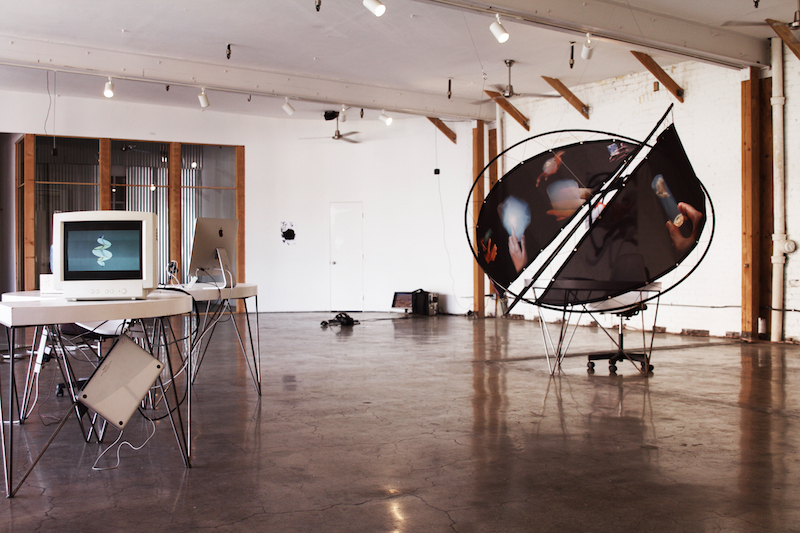 Natural light and breeze filled NAVEL, the spacious loft in which their exhibition took place, co-founded and directed by Jonas Wendelin, Kristoffer Josefsson, and Caspar Boehme in Downtown Los Angeles’ South Park district. Ströbele, curator and post-doctorate researcher at the University of the Arts in Berlin, and Greiner, an artist whose work deals with time-based sculptures, had forged a partnership earlier in 2015 by co-curating the first iteration of ‘24h Skulptur’ at Jan-Phillip Sexauer’s gallery in Berlin. 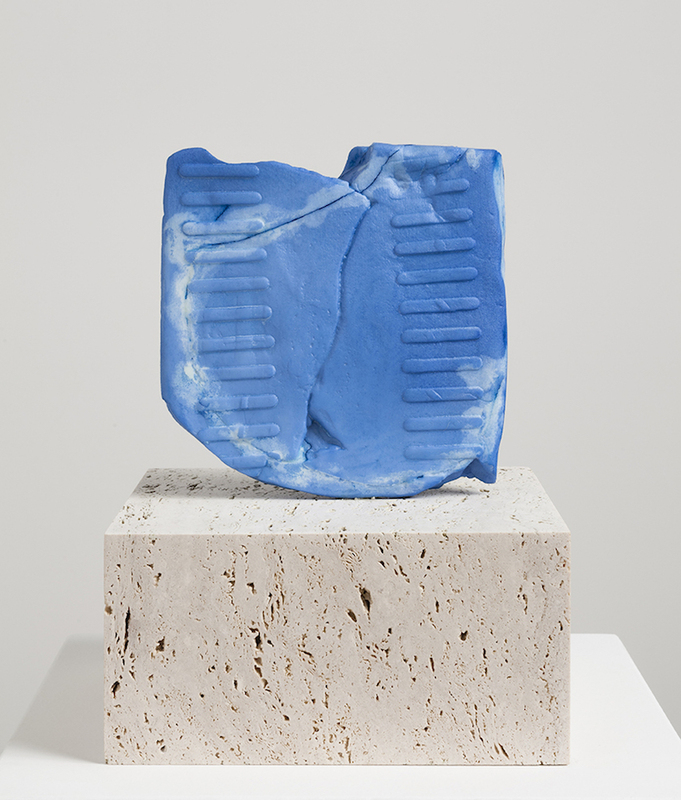 Channeling a similar investigation to their first installation, ‘Evolutionary Urge’ focused on exploring and showcasing works that challenge the traditional model of sculpture as monolithic and permanent. 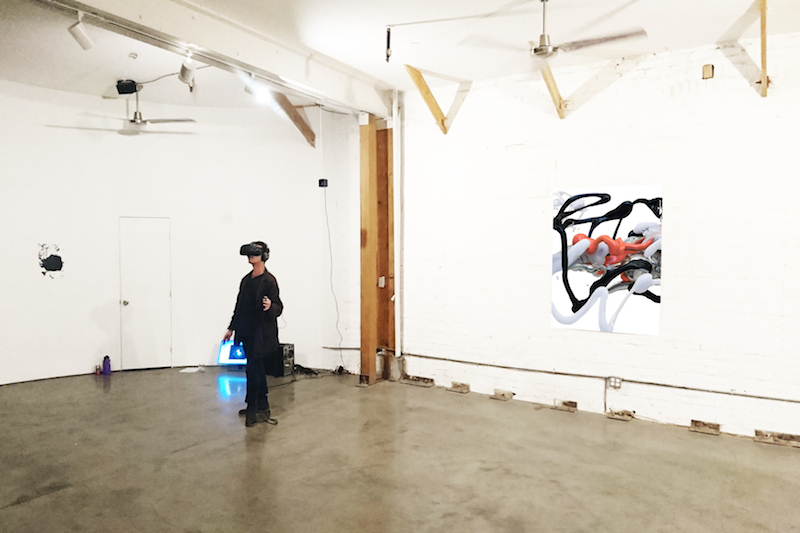 Instead, ‘Evolutionary Urge’ offered visitors a glimpse into the seemingly endless potentiality of sculpture in the digital age, with Computer Art, 3D Printing and Virtual Reality at the forefront. These digital technologies facilitate discourse surrounding the transience or temporality of sculpture and a new sense of agency that artist and viewer wield when producing and experiencing new forms of sculptural phenomena. The event itself challenged conventional modes of exhibition-making and implementation: it lasted for only 24 hours and was, according to Greiner and Ströbele, planned only two weeks beforehand—complementing the installations’ sense of time-specificity and fleetingness. One of the first pieces on view in the space was Nico Dockx’s ‘Everything touches everything, (from a whispering conversation with Jorge Luis Borges 1995)’. It is a stamp, following the exhibition’s call to re-imagine sculptural output. Ströbele administered the piece, asking visitors on which part of the body they’d like the print. The stamp is the vehicle for the print as sculpture, which can be reprinted and reproduced. The stamp, already redefining sculpture not as a three-dimensional static object but as a shifting and duplicatable entity, is also victim to the body’s agency; the body’s own natural sweat and oils, accumulating over time and absorbing the stamp’s ink, dictate the duration of the sculpture. A table was lying in the middle of the exhibition space, with three separate works. The first was a series of proto-computer-generated images by computer graphic artist pioneer, Herbert W. Franke. The images, which were displayed on an old monitor, included ‘Spindel’, ‘Space Loop’, ‘Donut’, ‘Falter’ and ‘Polyeder’. In the press release for ‘Evolutionary Urge’, the curators provided a quote from Franke, asking: “Could the computer lead us also in new areas of sculpture? A way to find an answer is to ignore the mentioned conditions for physical realization and try to design not realizable 3D-Forms”. Franke’s dedication to new and innovative modes of technology, and new approaches to sculpture therein, serve as a blueprint for contemporary artists who seek to expand the boundaries of sculpture that otherwise couldn’t be constructed or manifested physically. Next on the table was Michael Staniak’s ‘STL_839’, a 3D printed sculpture constructed from hand-dyed nylon polymer and mounted onto a travertine base. The sculpture was an ambiguous, flattened form of a sky blue hue. The piece resembled a crushed carton or vague receptacle one could find in a recycling bin. Its inception, production and existence depended on the use of a CAD program, and subsequently a 3D printer. ‘STL_839’ thus acts as a crucible for human and computer exchange, where the artist designs a sculpture virtually, and is then manufactured and realized into form by a machine, challenging the dynamic between sculptor and material. Likewise, questions arise surrounding authorship and the potential for mass reproduction when the sculpture’s blueprint can be easily transferred through computer files. 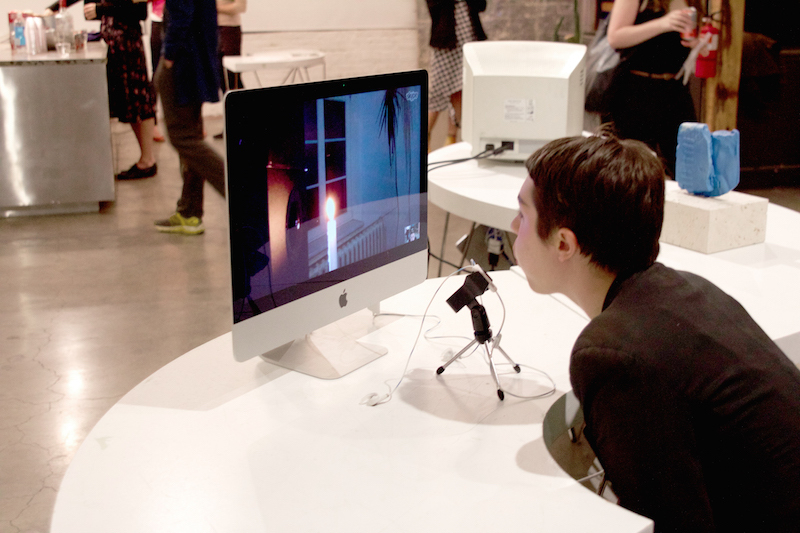 Lastly on the table was an installation by Niko Princen, which consisted of a Mac Desktop peering real-time into Princen’s apartment in Berlin at a lit candle, where he sits out of the camera’s view. The viewer, who is also being recorded, blows on the screen towards the candle, where the concentrated exhalations are picked up from the microphone and transmitted through a subwoofer on Princen’s end. The sonic waves that emit from this subwoofer are capable of extinguishing the candle in Princen’s apartment. Nonetheless, Princen’s work feels gimmicky, a piece that seems to fall short of the rest of the installations’ messages. Artist duo Banz & Bowinkel’s virtual reality sequence ‘Mercury’ led the viewer into a lofty and dreamy exploration sequence, where they moved themselves through different floating platforms, each inhabited by bizarre events. ‘Mercury’ seems to fit Franke’s model of envisioning the possibility of computer sculpture; the viewer is introduced to a new and imagined architecture that would have been impossible to replicate otherwise, and navigated at will, culminates in an interactive and virtual sculpture.